devorelebeaumonstre.com | Pittsburgh, PA | Fashion & Personal Style Blog by Stacey Belko: shop beaumonstre + giveaway. I feel like having a blog shop has become synonymous with having a blog so BAM I jumped on the bandwagon. Since I have no patience to measure clothing, jewelry it is. All pieces are brand new, not used. & the best part is that everything is under $5.. so go take a peek-sy HERE. EXTRA ENTRY if you tweet "follow @StaceyBelko & RT for a chance to win a turquoise ring from her shop: http://shopbeaumonstre.bigcartel.com"
Giveaway will be open until Friday, July 8th & I'll pick a winner at random! & congrats to Jel, the winner of the Material Attention giveaway! 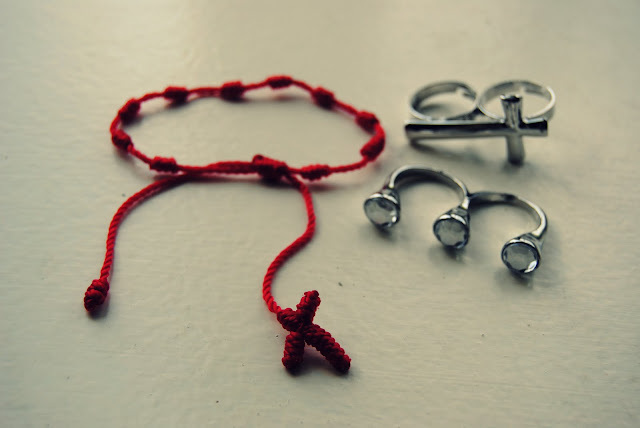 I just ordered the cross ring :D I can't wait! I love the two-finger cross ring! i follow (@bargainbex) and i did done tweet all about this lovely and oh-so-turquoise-y giveaway too! 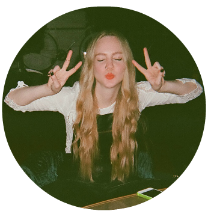 I followed you on Twitter @feliceraina and thanks so much for commenting on my blog you're the only one so far! So thankful:) !! I'm in love with the double finger cross ring!! I like the diamond rings! I'm pondering setting up a bigcartel shop too. 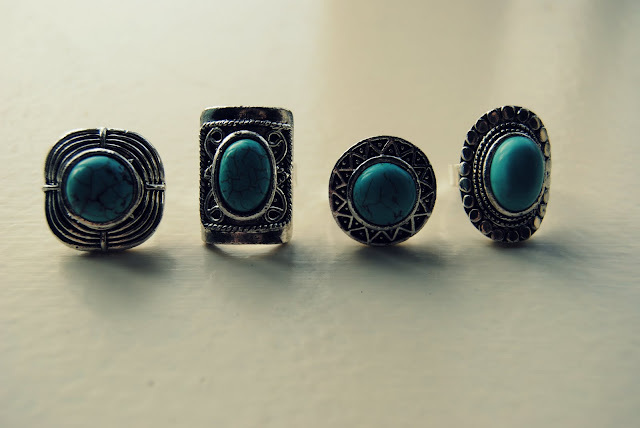 :) I love the turquoise rings! I follow you on twitter, my username is @madelinequaint. I'm following you as @LuisaTormenta and i tweeted that words. The cross ring is awsome, cant believe it sold out! Will you have more in the next days? And I tweeted about your giveaway ! wow. ahahah. that's so awesome. I'm following you on twitter ( mfashionfreak ) and I just tweeted about your giveaway. This is such a lovely give-away. Look these accessories! I especially love the double rings/knuckle dusters! and the red bracelet! enter me [lease and thanks for such a great giveawa! I'm following you (@hopevictoria)! Great giveaway! love the second shot. beautiful! I'm not on Twitter except for work, but I love those rings! yayy, these rings are amazing!!!!!! EVERYONE SHOULD JOIN THIS GIVEAWAY AND/OR BUY STACEY'S JEWELRY BECAUSE SHE IS COOL AND SEXII. AND ABOVE AVERAGELY AWESOME. I got the cross ring i ordered today, I'm so in love with it! I love the way you wrapped it! I enjoyed your blog a lot! there is also a giveaway on my blog. Im giving away a $175 ring seen on Nicki Minaj . all you have to do to enter is like the facebook fan page and post on my wall.